Has FNSB issued its first air quality fine? CAF will post the address when confirmation is received. Fine may be $100 (violation of visible emissions standard, 1st offense) or $500 (emissions crossing property lines, 1st offense) depending on section of code was violated. 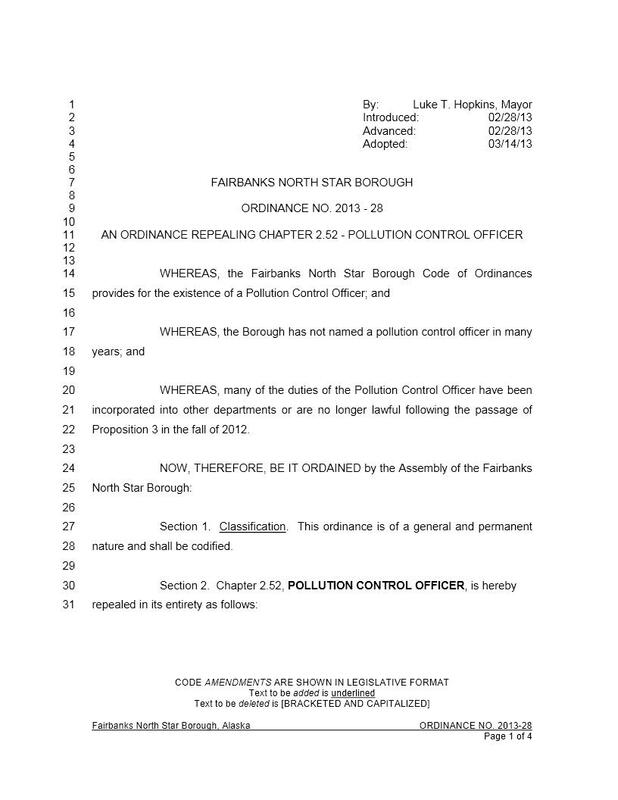 The Fairbanks North Star Borough is issuing its first citation for an air quality violation, nearly a year after a program to monitor pollution was put in place. “It either just happened recently, or it will happen first thing tomorrow morning,” Jim Williams, the Chief of Staff for FNSB Mayor Karl Kassel, said at a Borough Assembly meeting Thursday. Williams said the Kassel Administration reached out to the Kellum Street individual being cited at least ten times since October. He adds Mayor Karl Kassel wanted to be the first to make the call to take action. Would an ordinance weaker than state regulations (including the final SIP) risk termination of the local control program and state funding per AS 46.14.400, AS 46.14.410, and 18 AAC 50.015? Instead of addressing this question, coverage in the Fairbanks Daily News-Miner is limited to reporting on opinions from three North Pole City Council members. 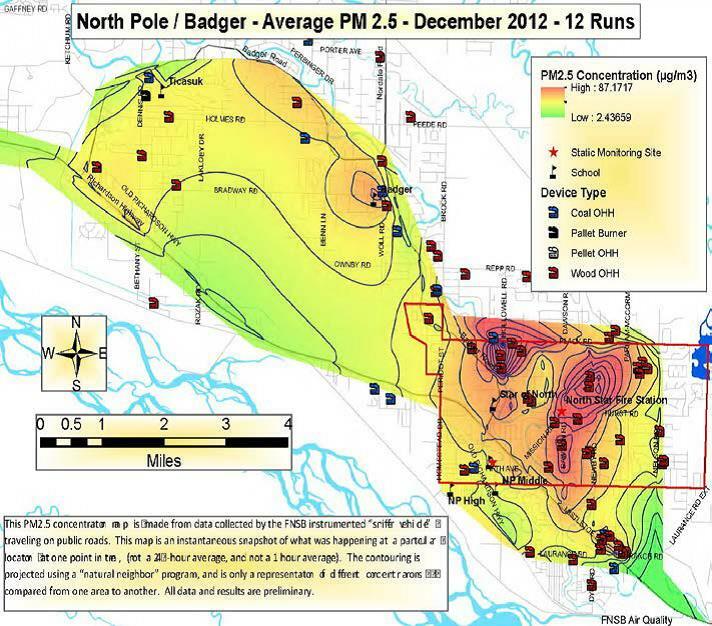 North Pole leaders offer differing opinions on borough air quality plan 2/26/2015. During recent public hearings on development of a new air quality ordinance, 2015-01, there was no mention that the new ordinance needed to be at least as stringent as the new plan approved by the State or the Borough risks losing local control. The Assembly went so far as to amend into the draft ordinance a control zone, in effect shrinking the boundaries of the designated PM2.5 nonattainment area by removing the northern third of the nonattainment area. The revised control zone excludes part or all of Chena Ridge, Sheep Creek, Goldstream, Fox, and Gilmore Dome neighborhoods, view proposed “Air Quality Control Zone” map. Not only is there no data to support shrinking the nonattainment area, to do so violates State and Federal law. The idea that air quality must be a compromise seems to have thrown the Assembly off track. Like it or not, long-delayed deadlines and controls take effect Feb. 28, 2015. Opportunities to develop a local plan were squandered years ago. The Assembly holds only these options: follow the State program, strengthen it, or get out of the way. Weakening controls established by the State risks termination of local control and funding granted to the Borough for the program. The latest version of ordinance 2015-01 appears to include an error in the “whereas” statements. The last statement on page 2 refers to “draft regulations” issued by DEC that are “intended to be part of the State Implementation Plan as required by the EPA.” The regulations issued by DEC are no longer in “draft” form. They are FINAL regulations that have been fully adopted by DEC (and signed by the Lieutenant Governor) and they constitute state regulatory law beginning Feb. 28, 2015. DEC’s website makes plain that the regulations are final. The draft Borough ordinance also notes on page 2 that the Borough has been authorized by DEC to operate an air quality control program “in lieu of and consistent with the State’s air quality program.” This is accurate, although the key word is “CONSISTENT.” Any local air quality control program must operate in a manner that is “consistent” with DEC requirements. This is specified in the statutory provision that allows for the existence of the Borough’s local air quality control program. Per AS 46.14.400(a): “With the approval of the department, a municipality may establish and administer within its jurisdiction a local air quality control program that operates in lieu of and is consistent with all or part of the department’s air quality program as established under this chapter.” (emphasis added). 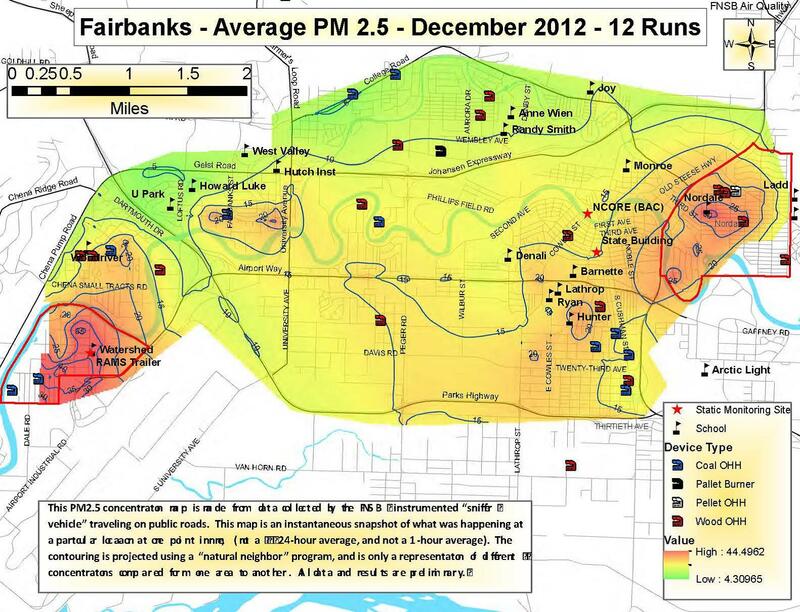 By Alaska statute, to be “consistent,” the Borough’s local air quality control program MUST implement DEC regulations. This is specified in AS 46.14.400(f): “A municipality or a local air quality district administering a program under this section shall administer its local air quality control program according to this chapter, regulations adopted under those sections, and its cooperative agreement under (d) of this section.” (emphasis added). The only exception to the statutory requirement that a local air quality control program administer state regulations is for “more stringent” local requirements, which may be adopted with DEC approval. See AS 46.14.400(f). A local air quality control program may only operate if approved by DEC. See AS 46.14.400(a). If a local air quality control program is NOT administered in a manner that is consistent with legal requirements, DEC can revoke approval and terminate the program. See AS 46.14.410. The boundaries of the nonattainment area are set by EPA, whose delineation constitutes federal regulatory law. The boundaries of the nonattainment area are further codified in DEC’s regulations, which incorporate by reference the delineation of the EPA administrator. See 18 AAC 50.015. In light of the foregoing, it would be UNLAWFUL, DISRUPTIVE, and ultimately POINTLESS for the Borough to adopt less restrictive air quality regulations. Because state law requirements govern no matter what the Borough decides, inconsistent local measures risk unnecessary confusion and the potential that residents might face enforcement consequences for violation of state regulations—which they must obey no matter what the Borough says. (NOTE: Page 4 of the DEC-Borough MOU specifies that a violation of a DEC regulation will be handled by DEC.) Adoption of inconsistent local regulations risks termination of the Borough’s local air quality control program by DEC and funding provided for this program by state and federal agencies. The adoption of inconsistent regulations by the Borough—and the attendant confusion and uncertainty about the extent to which state regulations are in force—likely would undermine the chances that EPA will approve the SIP submitted by DEC in January. 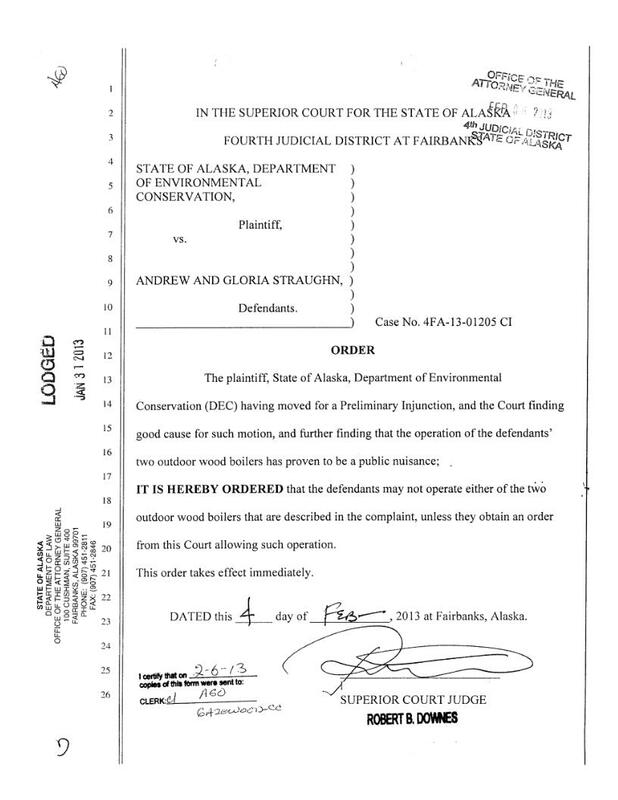 If DEC’s SIP submission is not approved by EPA, the clock will start running on potential sanctions for Fairbanks, including stricter permit requirements for new major source, the loss of highway funds, and imposition of restrictions by EPA. Note on Data Gap: In 2008, Mayor Jim Whitaker requested a time extension on the nonattainment boundary decision, insisting it was not “to delay addressing the problem,” but to resolve the “significant gaps” in the data used to set the nonattainment boundary. Link to source. (Whitaker is now chief of staff for Governor Bill Walker.) CAF encourages readers who are data driven to review the data used in 2008 to successfully press EPA to shrink the size of the nonattainment area. Link to ADEC nonattainment documents. Some will say the Woodriver smokers, Andrew and Gloria Straughn, will see this post and stop burning. We say, go right ahead and stop. That’s exactly what they should have done over 4 years ago. The Straughn’s got the order. It’s public record. Why shouldn’t you see it too? Here’s what we LOVE [Hey, it’s Valentine’s day!] about the court order. “…(T)he Court finding good cause for such motion, and further finding that the operation of the defendants’ two outdoor wood boilers has proven to be a public nuisance;” Thank you, Judge! That’s a first for Fairbanks! Did the Straughns violate the order? Yes they did. Tomorrow we’ll publish a new set of photos. The evidence is in. Does the State have the juice to go after the Straughns for contempt of court? They better.